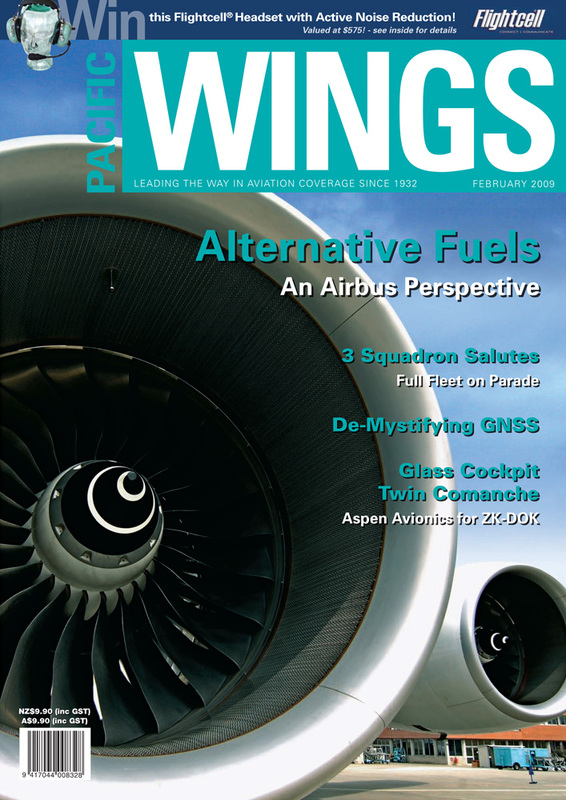 In December last year, Pacific Wings spoke to Sebastien Remy, the head of Alternative Fuels Research Programmes for Airbus, about Airbus’s views on sustainable alternative fuel for aviation’s future; Helen Osmaston reports. Chris Hinch summarises the operational benefits of modern active tracking systems as tools for both safety and productivity. GNSS, WAAS, ABAS, SBAS, GBAS, GRAS, APV Baro-VNAV, LPV—and a host of other acronyms—are all part of the GPS-related landing approach revolution that is sweeping the globe. Richard Greaney makes some sense of it all. Alan Breen explains why ZK-DOK’s owners chose an Aspen Avionics “glass cockpit” module and a Garmin GNS 480 as the core components of an upgrade to bring DOK’s outdated cockpit into the new century. Pacific Wings joined the RNZAF’s 3 Squadron in December for an impressive formation flight by a full complement of its five Sioux and 14 Iroquois helicopters. Rob Neil has the story.